I love homemade ice cream. The smoothness, the richness, the fact that I made it. There is no store-bought ice cream that comes close to the taste of ice cream made at home. I have tried many recipes, and all come out great. But I was running late with dinner plans on Memorial Day, I believe it was (a perfect holiday to have a BBQ and ice cream) and I didn't have time to cook eggs and go buy more milk, etc. so I came across this recipe from Eagle Brand, I had everything on hand, and I'm glad I did. This was creamy, rich, easy, and best of all had awesome vanilla flavor. And besides the obvious need of ice and rock salt it is only 3 (THREE) ingrediants!! Mix all ingridents together in a bowl. Pour into 2-quart ice cream freezer. Follow your manufacturer's instructions. 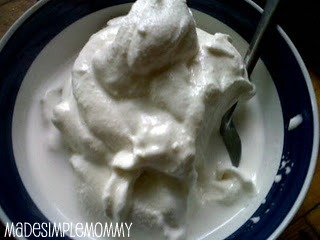 (Add ice and rock salt) When it is done your ice cream should look this creamy and delicious!